A frighteningly prescient novel of today’s America—one man’s story of a racially charged real estate experiment in Detroit, Michigan. Greg Marnier, Marny to his friends, leaves a job he doesn’t much like and moves to Detroit, Michigan in 2009, where an old friend has a big idea about real estate and the revitalization of a once great American city. Once there, he gets involved in a fist-fight between two of his friends, a racially charged trial, an act of vigilante justice, a love affair with a local high school teacher, and a game of three-on-three basketball with the President—not to mention the money-soaked real estate project itself, cut out of 600 acres of emaciated Detroit. Marny’s billionaire buddy from Yale, Robert James, calls his project “the Groupon model for gentrification,” others call it “New Jamestown,” and Marny calls it home— until Robert James asks him to leave. This is the story of what went wrong. You Don’t Have to Live Like This is the breakout novel from the “fabulously real” (Guardian) voice of the only American included in Granta’s Best of Young British Novelists. Using the framework of our present reality, Benjamin Markovits blurs the line between the fictional and the fact-based, and captures an invisible current threaded throughout American politics, economics, and society that is waiting to explode. 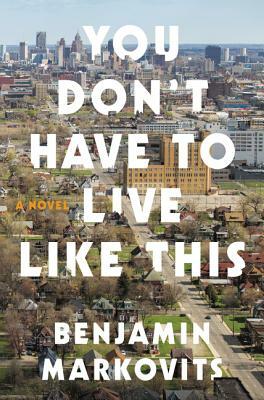 Benjamin Markovits is the author of You Don’t Have to Live Like This, forthcoming from Harper. He left an unpromising career as a professional basketball player to study Romanticism. Since then he has taught high-school English, worked at a left-wing cultural magazine, and published seven novels, including a trilogy on the life of Lord Byron.